We’re all going to be writing a continuation of the same story with the same characters in eight parts? Say what? When I heard the premise of the TOUGH JUSTICE project, I was intrigued, excited and...dubious. Of course, we weren’t going to be heading off willy-nilly on our own with no compass, but there was just enough willy-nilly to make it exciting. Three other authors and myself were all given rough outlines of our episodes with the instruction to fill in, enhance and flesh out, but the way we each accomplished that made for some interesting hiccups. One of the most fascinating aspects of working on this project was the realization that four people can read the same description and come up with four different interpretations. I suppose that aspect of the project shouldn’t have surprised me, but I had never written with a partner before. When I started working on my episodes, I had a very different mental image of Lara Grant compared to the other authors on the project. This became apparent in the way we each dressed Lara. Lara is a tough cookie, but I envisioned her as steel encased in velvet and that extended to her wardrobe. I didn’t see Lara as someone necessarily strong physically, but definitely a woman with a tough mental capacity. My Lara could wear pencil skirts and high heels and destroy her adversaries with one look. Some of my co-writers had her in jeans, ankle boots and a suede jacket and that’s eventually the look that prevailed. I did manage to dress Lara in a skirt and heels for a pivotal scene with Moretti, and in that scene the clothes made the woman. Lara’s clothing was one of the biggest discrepancies, but these discrepancies between the writers popped up all over the place and in unexpected situations. What kind of coffee did Lara drink, black or designer? What did the Crisis Management Unit workspace look like? Cubicles with a receptionist out front or an open “war room” with a shared white board and pizza for those late-night jam sessions? Luckily, we all had each other’s email addresses and there was a lot of back-and-forth regarding certain details, but you can’t check with someone else every time you write a scene. So, that’s why we have editors! They smoothed out the seams and made sure there was a certain level of consistency throughout the episodes. However, there is no escaping the fact that the eight episodes were written by four different authors—and this is what gives the series its little twists. Every author has a certain style or voice. This voice comes from sentence structure, word choice, the percentage of dialogue, action, inner thoughts in a scene, and the level of emotion. The author herself is not necessarily cognizant of her own style. I know I’m not. 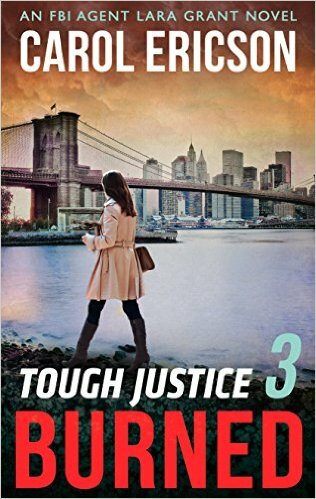 But a project like TOUGH JUSTICE is a good study in how writing styles can differ. When readers of this series switch from one episode to the next and so on, they’re going to get immersed in an entirely different writing style from each of the authors. We hope our audience enjoys reading this series as much as we enjoyed writing it! So get reading today, book #1 is FREE! 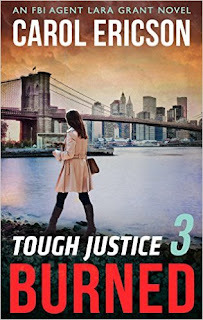 For more information about the series, visit ToughJusticeSeries.com. I read Part 1 last night and loved the character Lara. Sorry, but I have to agree with your co-writers, she doesn't strike me as a skirt and heels sort of heroine. (I don't think she would wear anything that would get in the way of getting the job done.) But to each her own. :) I love to read books about heroines where the ACTIONS make the woman, not the clothes.